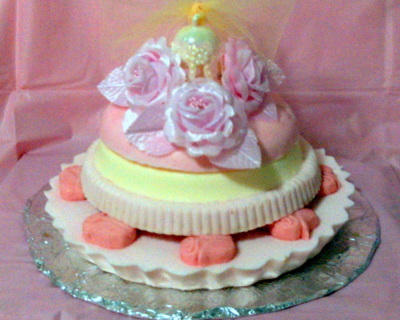 MILLY VERCHAR handmade Exotic Soap Cakes are made in fragrances of Exotic, Floral and Romantic. Each layer of the soap cake has a different fragrance. 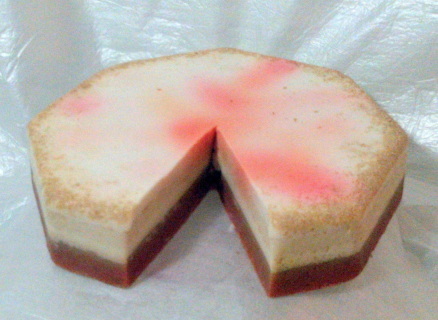 Exotic soap cake has a different exotic fragrance in each layer. Floral soap cake has a different floral fragrance in each layer. Romantic soap cake has a different romantic fragrance in each layer. Top tier 4 different styles, Romance Me Wedding Cake Soap top styles to chose from. Depending on availability the top tier may vary. 3 Tier Shea Butter Wedding Soap Cake, has 2 layers to each tier with a different fragrance to each layer. The first layer of each tier is gold, the 2nd layer to each tier is white with little gold hearts. This 3 tier wedding cake soap has 6 different fragrances, exotic, romantic and floral. 2 of the tier are resting on petite Shea butter and herbal oil blend sugar scrub with rose and lavender buds, fragrance is 2 exotic and 2 floral. 1 white flower bouquet and designer style ribbon bow on top the first tier. 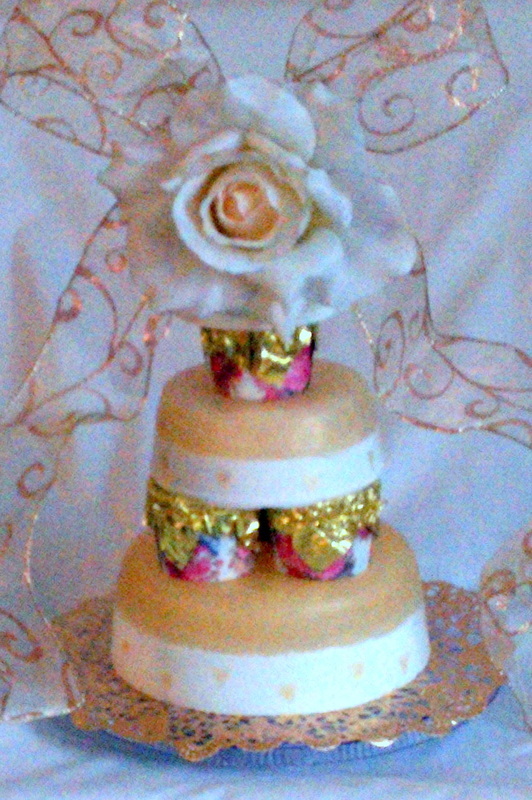 3 Tier Shea Butter Wedding Soap Cake, has 2 layers to each tier with a different fragrance to each layer. The first layer of each tier is gold, the 2nd layer to each tier is white with little gold hearts. 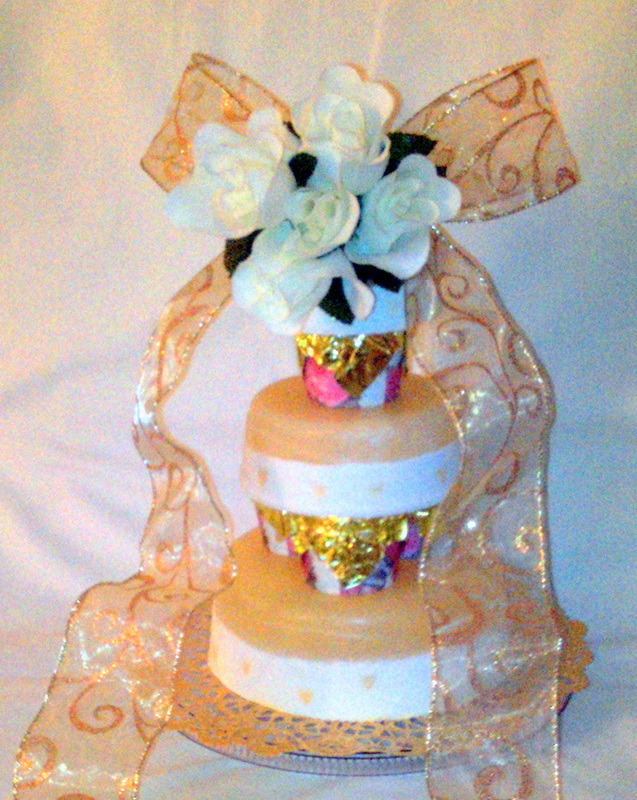 This 3 tier wedding cake soap has 6 different fragrances, exotic, romantic and floral. 2 of the tier are resting on petite Shea butter and herbal oil blend sugar scrub with rose and lavender buds, fragrance is 2 exotic and 2 floral. 1 white flower and designer style ribbon bow on top the first tier. 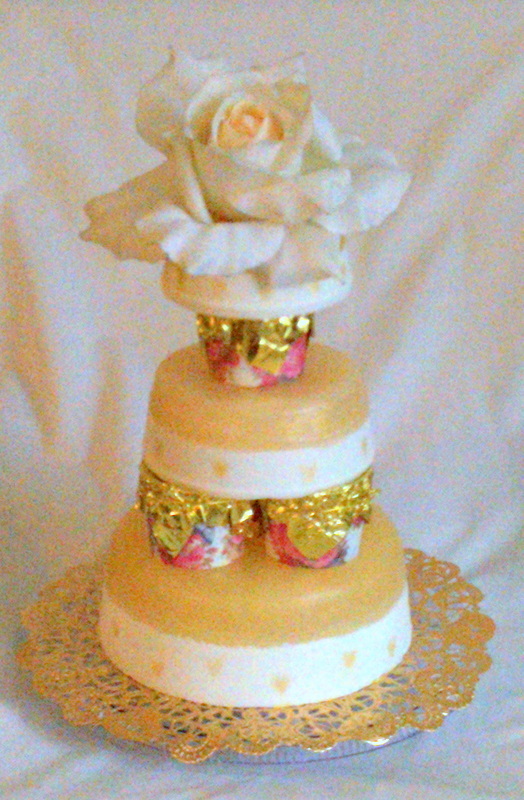 3 Tier Shea Butter Wedding Soap Cake, has 2 layers to each tier with a different fragrance to each layer. 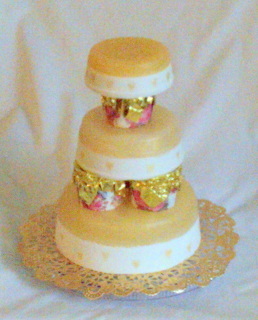 The first layer of each tier is gold, the 2nd layer to each tier is white with little gold hearts. This 3 tier wedding cake soap has 6 different fragrances, exotic, romantic and floral. 2 of the tier are resting on petite Shea butter and herbal oil blend sugar scrub with rose and lavender buds, fragrance is 2 exotic and 2 floral. 1 white flower on top the first tier. 4 Tier Mango Butter Soap Cake, 8 hand carved rose buds sprinkled with sugar, moisturizing herbal blend oils, exotic and romantic fragrances and color.